The holiday season is officially upon us, and so is black friday weekend. There’s a lot to look forward to whether you’re looking to get ahead on your holiday shopping, get your family tree, or check out unique artisan creations. Whatever you chose, be sure to bring your friends and family along to enjoy the beginning of the holiday season. 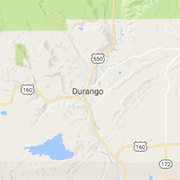 This Black Friday weekend, be sure to shop local with Durango! Over 40 merchants will be participating in the Red Balloon Event, bringing you a weekend pack full of deals. There will be sales, events, activities, and more! And because parking is free on weekends, you can spend as much time as you want browsing the Durango deals. Enjoy a stroll downtown town and keep your eyes peeled for the red balloons! This event is great for those looking to enjoy Black Friday deals while supporting local businesses. Stop by the Durango Art Center Friday or Saturday to browse this signature community event, the Winter Solstice Artisans’ Market. The art center is open 10am-5pm both days, and will feature gifts and pieces from over 40 regional artists selected for their high-quality original creations. Some of the crafts include ceramic pieces, handmade jewelry, ornaments, and more! This event is perfect for someone looking for one-of-a-kind holiday gifts for their friends and family. The train has arrived! It’s time to get the family together and head out to Cascade Canyon to find the perfect family Christmas tree! 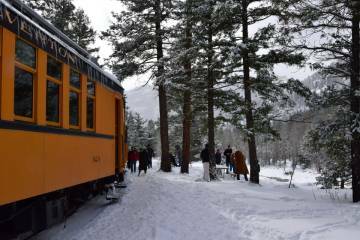 Join one of Durango’s holiday traditions with the Durango & Silverton Narrow Gauge Railroad for a family friendly event you’ll be sure to remember. You’re going to want to bring a camera to capture the memory of cutting down your own tree. Because of the colder temperatures in Cascade Canyon, passengers will be treated to complimentary hot chocolate on the ride back. This event is ideal for families and friends looking to start, or continue, a Durango local tradition.